While there were no Choupette spottings at yesterday's KARL by Karl Lagerfeld collection preview, the designer's new kitten would have felt right at home at the presentation. Everywhere you looked, you couldn't escape the Kaiser's sunnies-and-ponytail-bedecked profile — we're talking about everything from sweatshirts to bags. Besides the obligatory face-shots, there were definitely some pieces to love in the new line — to be sold exclusively on NET-A-PORTER.com starting Wednesday, January 25: silver sequined leggings and detachable collars, stop-and-stare metallic dresses, leather biker jackets, and gleaming, buckled wedges. And, the price-point will leave you with a little bit of cash left over for your Chanel fund — the average sticker-shock hovers in the $200 range. 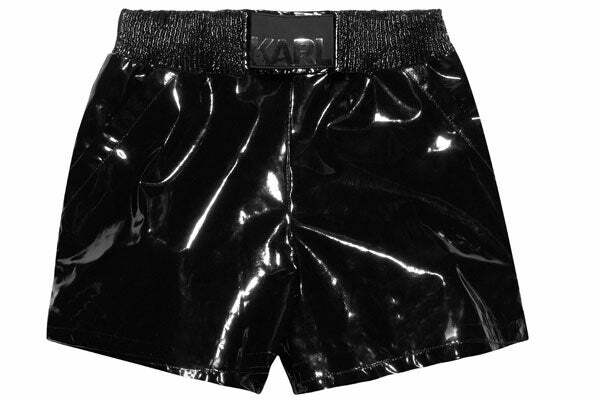 Of course, no Lagerfeld moment would be complete without a little something extra, and we think these PVC "Sabine" shorts do the trick quite nicely. So, they're not exactly billed as workout wear, and at $175, they're a bit steep for the daily grind at Equinox, but we're still thinking of sweating it out in these babies (take that, girl who stuffs her sweaty socks in that new Céline bag). And maybe wearing them out of the gym...after a nice, cold Magnum, of course.